From Northwest Portland to Astoria, the way we think is most fun and rewarding. There are times that a quick getaway isn’t quite enough but your work/life schedule doesn’t allow the luxury of packing it up and going away for days, either, so what better way to unwind than a healthy dose of day tripping? For those of you who aren’t familiar with the concept, day trips are those rides that you can finish in one full day, 6-10 hours of relaxation, exploration, or just mindless wandering. 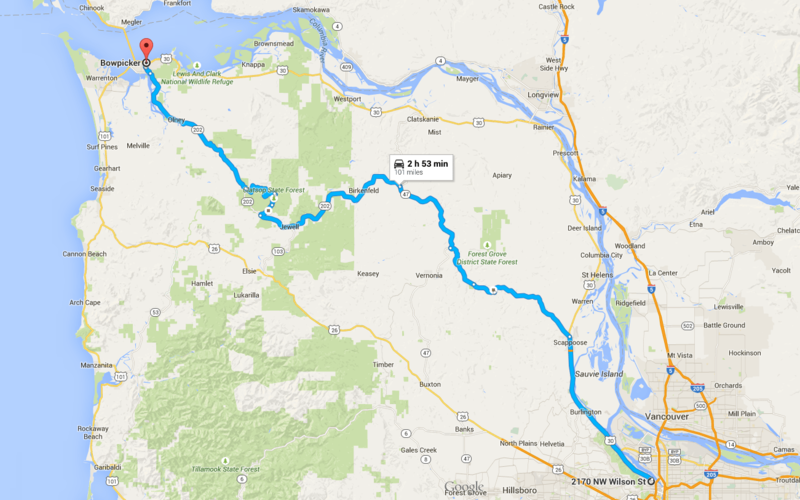 The Portland to Astoria and back ride is a prime example of a proper day trip. There are many roads that are fit for this but we tend to enjoy the ones without clutter of cars, trucks and trailers. First things first, to get this ride started, get out of Portland. Find your way to Highway 30, which heads northwest out of the city through a colorful array of industrial buildings, train depots full of locomotives, and the lovely St. John Bridge. Once past the big green bridge, you’ll notice that the scenery starts turning green and the road opens up a bit. There are a handful of gas stations on the way to your first destination, Scappoose, OR, which is roughly 20 miles north of Portland. At Scappoose, we would suggest fueling up as there won’t be another gas station for about 78 miles. The road and scenery changes, altogether, once you enter the Scappoose/Vernonia Highway. Train tracks and dual lane highways give way to trees, curves and two lane heavenly side roads that are resplendent with every shade of green as far as the eyes can see. Traffic is typically non-existent on this road and so is cell phone reception (at least if you’re on the T-Mobile coverage) so keep your wits about you as the curves and corners increase in quantity and quality. Scappoose Vernonia HWY dead-ends at Rte 47. For this ride’s sake, take a right turn and head north towards Astoria. You’ll barely notice as the road changes designations from 47 to 202. You could keep on Route 47, if you like, and enjoy some of the most curvaceous tarmac, this side of the Mississippi, which will take you all the way back to Highway 30 at Clatskanie, OR. If you do this, turn left at 30 and enjoy a leisurely ride to Astoria. We suggest staying on 202 for a more scenic ride along the Nehalem river with a pretty big chance to see some wild elk along the grassy flatlands that come into view, once in a while, through the otherwise never ending canopy of trees. As you delve deeper into Route 202, you’ll notice the curves getting tighter, with suggested speeds of 25MPH. Take your time and get to know the road and, if you’re in a group, keep the pace at a safe distance and don’t rush each other. This road is too beautiful to rush through, at least the first few times you traverse through it. Just as you wonder to yourself if there’s any more curves, the road opens up to the beautiful Youngs River which feeds into Youngs Bay at the south side of Astoria, at the very peak of North West Oregon where land meets the mighty Columbia River as it pours into the Pacific Ocean. Follow 202 towards 101, as the signs will suggest, and into Astoria. You’ll be treated to one of the most PNW-ish sights, which is the beautiful town of Astoria with its coastal style homes, perched on the hills with their views of the Columbia River, the amazing Highway 101 bridge that connects Oregon to Washington State. You’ve made it and are likely ready for a bite to eat and the Pacific Northwest is well known for its incredibly fresh sea food. Astoria is well known for the cult classic movie, The Goonies, but loved by some as home to the very well-known roadside Fish and Chips restaurant, Bowpicker (1634 Duane St, Astoria, OR 97103 503-791-2942). While there are plenty of other choices in town, equally as tempting, we suggest parking your motorcycle next to the makeshift food cart, which spent its previous life as a boat in the waters of PNW. The fish is perfectly seasoned and fried to a golden-brown delicious, accompanied by perfectly salted chips and will not disappoint. Take a walk around town, towards the Columbia River, and check out all of the neat shops which are shockingly un-touristy, run and filled by the locals who very clearly love their beautiful town. Say hi to the seals that fill the air with their barks! There are a few options for coming back to Portland, from Astoria. One is to retrace your ride into town but we’ve been told that after a few hours in town, enjoying the wares and foods, hopping on Highway 30, south, is the simplest and easiest route home. We’ll let you be the judge on how to end your ride. We like the curves, so we might take HWY 30 down to Clatskanie to hop on Route 47, south, towards Scappoose/Vernonia HWY, back towards Portland through the first half of the ride that got adventure started in the first place. Let us know how you liked this ride and any other suggestions which might enhance it for everyone else.